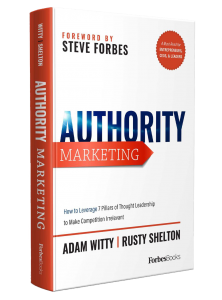 I’m so excited to introduce my newest book, Authority Marketing: How to Leverage 7 Pillars of Thought Leadership to Make Competition Irrelevant (ForbesBooks, 2018)! I’m honored to have written the book alongside my friend Adam Witty, Founder & CEO of Advantage Media Group | ForbesBooks, which acquired my first agency, Shelton Interactive, in early 2016. He and I are both humbled that Steve Forbes wrote the foreword for this book. So what is Authority Marketing? It is the strategic process of building personal Authority in the new media landscape. In this book Adam and I make a counterintuitive case for thought leadership over corporate marketing as the most important growth tool for your business and, by extension, your impact and we provide a specific system you can use to grow yours. One of my passions in life is empowering people to get their message out to make an impact and I believe Authority Marketing is the most effective way to do just that. When most people think about marketing they tend to gravitate toward corporate marketing, whether they are building a business, running a non-profit or working as part of a larger institution. As a result of this traditional “build the brand!” mentality, most people take a significant backseat to the “corporate” brand in terms of visibility, which unfortunately limits their impact. Instead, when you focus on Authority Marketing – you begin with the thought leader – not the brand – and, as a result, you make a much larger impact for several reasons. First, when you focus on a corporate brand, you are often competing against brands that have several decades’ head-start on you in terms of awareness and dramatically more money to spend on marketing. Additionally, when most people interact with corporate brands they are expecting to be marketed-to – on the flipside, when people interact with a thought leader or Authority, they are expecting to learn something, which dramatically shifts their perspective. Finally, as a general rule, we have grown increasingly distrustful of corporate brands and, as a result, we are giving our attention to individual thought leaders who we view as much more unbiased and trustworthy. In this new book you will learn how to use Authority Marketing to build thought leadership and dominate your competition by playing a game no one else knows is being played. To get more insight on the changing worlds of PR, journalism and book publishing (with a dose of college football), sign up for my newsletter.